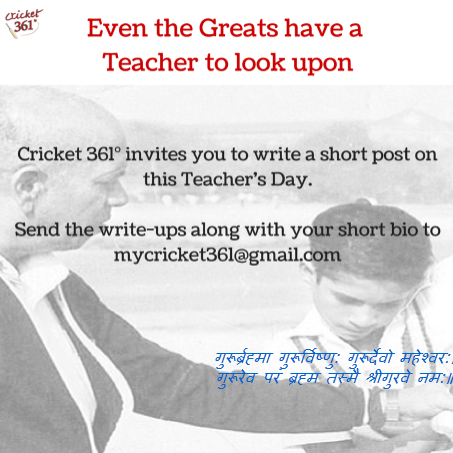 Cricket 361° invites you to write a 100-150 word post on this Teacher’s Day. Over the years, you must have been closely associated with the sport and some of you have extended your passion into playing the game. Teacher is a person from whom you have learnt something useful in life. Write about a player who has impacted your life or has helped you mold yourself into what you are today. Let us dedicate this Teacher’s Day to those great personalities. We will publish this write-up on our blog (cricket361.wordpress.com). Send the write-ups along with your short bio to mycricket361@gmail.com or reply here with it by 5th Sept, 2014 noon. It will give us immense pleasure to have you write for us. Thank you.